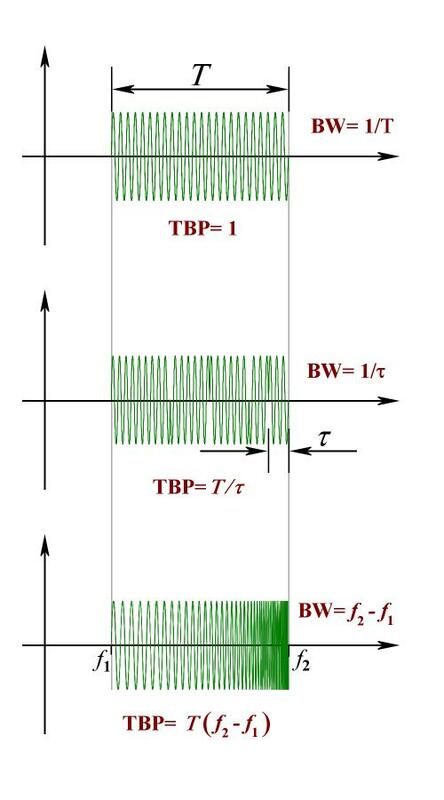 The product of pulse width Τ and the receivers minimum bandwidth BW theoretically required is an invariant called the Time-Bandwidth Product (TBP or TBWP). This is an important parameter for radar designers and a measure of the possible pulse compression rate and the expectant time-side-lobes. The radar receiver should have a bandwidth as small as possible to avoid receiving of additional noise and disturbances. But the bandwidth should be wide enough to let pass the desired echo signals. The shorter the pulses the wider the required bandwidth. The wider the bandwidths, the better range resolution can be achieved. The keyed on/off modulated pulse radar with a pulse length of Τ has a bandwidth of 1/Τ . 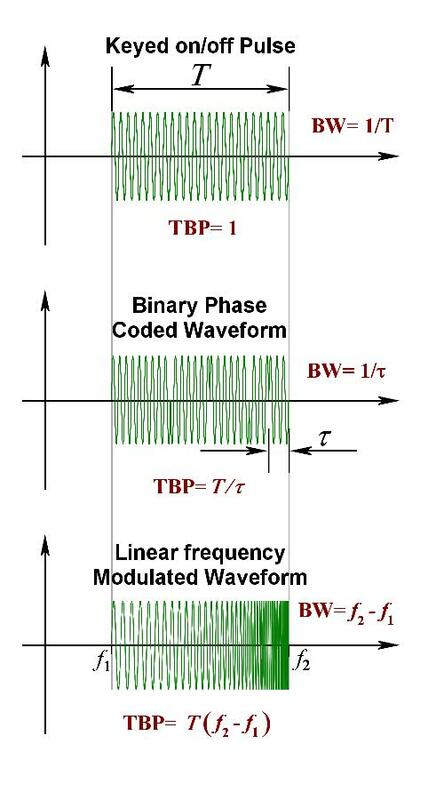 Its time-bandwidth product is therefore TBP = 1 and its range resolution depends directly on its pulse length. If the radar uses a binary phase coded waveform, then the bandwith is 1/τ ; and depends on the length of the compressed pulse τ. The time-bandwidth product is TBP=Τ/τ. A pulse compression radar using Barker codes would be limited to a maximum time-bandwidth product of 13. As you can see in this example, the time-bandwidth product is equal to the possible pulse compression rate. Radars using intrapulse frequency modulated waveforms may have TBPs of more than 100 up to 10 000. By linear frequency modulated waveform the bandwith can be measured by the difference of the upper f2 and the lower frequency f1 : BW = Δf = f2 - f1, and its TBP= Τ·Δf. E.g. : the air surveillance radar AN/FPS-117 has got an LFM waveform with the time-bandwidth product of 75. The possible pulse compression rate is nearly the same, so it can be calculated, that its range resolution in near range (Τ= 100 µs) is about 100 m.
The Gaussian pulse has the lowest possible TBP of ¼. (A Gaussian pulse is shaped as a Gaussian function and is produced by a Gaussian filter. It has the properties of maximum steepness of transition with no overshoot and minimum group delay.) In some older radar equipment, the receiver's bandwidth could be reduced to this value (so called: Limited mode of the receiver). Of course, this causes also increased internal losses since not all the energy components of the echo signal have been processed. However, it was possible to successfully bluff out interferences that were not exactly at the own transmitting frequency. An extremely high time-bandwidth product with a radar is TBP = 200 000 for the strategic radar AN/FPS-108 “Cobra Dane”.